This past week didn’t go quite as planned, so the painting step, scheduled for Wednesday night, was pushed off to tonight. 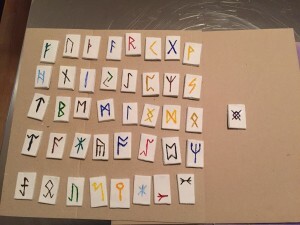 However, spending Samhain Night painting runes was wonderfully magical! I used Reeves Acrylic paints. Prang recommends an acrylic watercolor for painting Das clay. I like the Reeves colors because they are easy to work with, and the colors are clear and sharp. I wanted to avoid diluting the colors, since the Das clay goes soft when wet, so being able to use the paint straight out of the tubes was ideal. Reeves also makes acrylic watercolor paint, which is different from the regular acrylic paints I used, but again, since the clay reacts to water, adding water back via the paint seemed like it would produce undesirable results. I was quite glad I had smoothed the edges of the rune shapes, as the few places where I had not done so with full care, the paint bled into the ridges. This was easily addressed with the end of a toothpick dipped in water, as that provided just enough moisture to soften the ridge so I could remove it. There were also a few times where my fine motor skills were insufficiently fine, and I managed to get paint on a part of the tile that wasn’t supposed to be painted. Not to fear, though–my friend, the dampened toothpick, solved that problem as well. I will have to re-buff those tiles once the paint is dry, but it was helpful to be able to erase the misplaced paint. I chose the colors based on personal preference. Cweorth and Wendhorn, being fire-related, are red. Berkana is a rune of growth, so a vibrant spring green felt like the right choice. Isa is an icy blue. The upper symbol on Jera is green, the lower one is brown, reflecting the cycle of seasons. And so on, as I felt moved to match color to symbol. Next time around, I will see about finding brushes with even finer tips (if possible–these were pretty narrow), start with new brushes (these have been working with me for a while), and have a few more to hand. Total painting time: 1.5 hours. Total working project time to date: 4.5 hours. 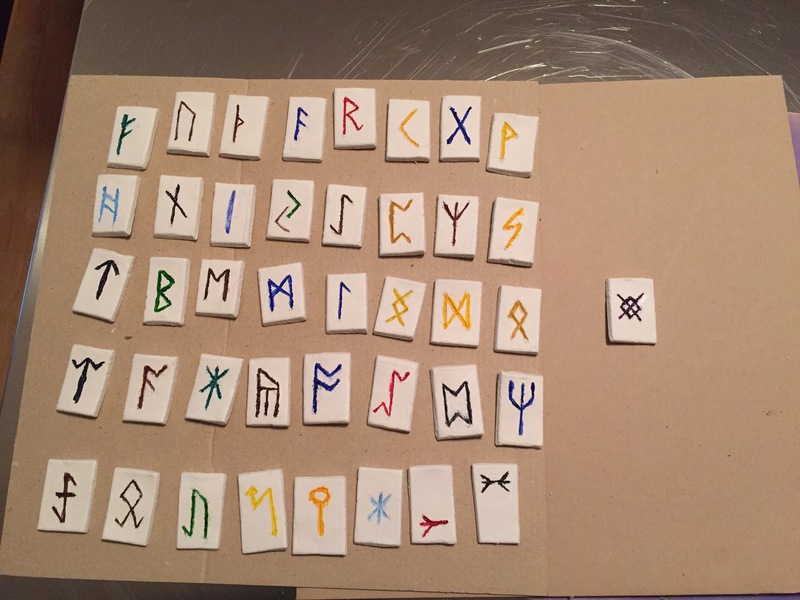 The paint needs just a few hours to dry, so the runes will sit overnight while I make a little more Samhain magic, and then sleep. The next step is to re-buff the few that need it, touch up the paint (if required), and then seal them. That’s on the schedule for Monday–check back on Tuesday to see how it goes!